The possibilities for a romantic rendezvous are endless, especially come Valentine’s Day. Whether your plans include a homemade picnic by the lake or a high-end evening out, there are ways to incorporate the traditional shades of red and pink into an outfit you won’t want to reserve for February 14 alone. Charming but comfortable pieces provide a no-fuss look for a no-fuss date. Pink chinos look sweet as can be, their cotton candy color tempered by the brown and navy in a striped tee and preppy walking shoe. You’ll be sure to catch his eye in a romper as playful as this one, especially if the nautical number is elevated with chunky platforms and an edgy, notice-me bag. If you’re the girl who would rather celebrate Anti-Valentine’s Day, a leather jacket is ideal. It transforms even the most precious of dresses into a tough look that will exude confidence and wit. Wearing an elegant full skirt will transport your date back to the days of mid-century beauties. With a feminine blouse and pointy-toed shoes, the vintage look achieves a rare balance of grace and mirth. A close-fitting red dress like this one is enchanting, with a longer length eliminating any vulgarity, but none of the allure. 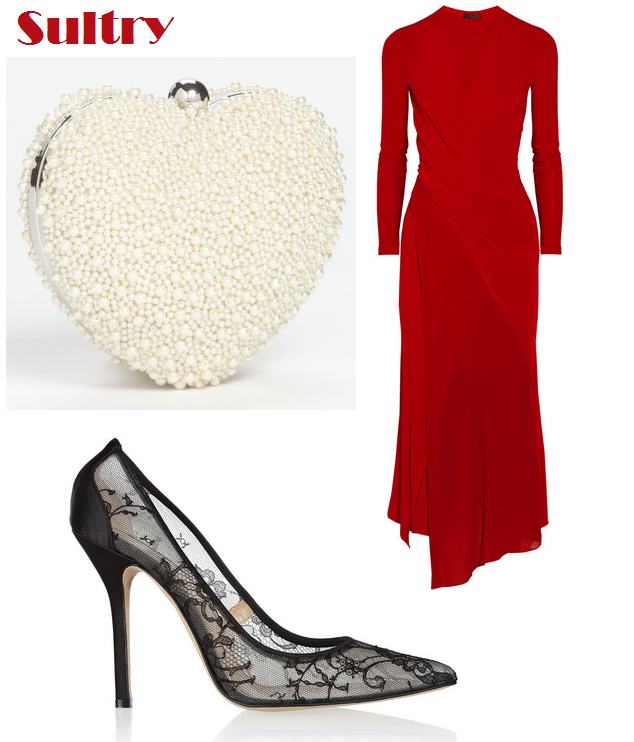 Black lace pumps and a heart-shaped clutch add even more glamour to the bold look.